The French President was elected in May 2017. EMMANUEL MACRON SWEPT to victory in France 17 months ago this weekend. It was an insurgent campaign by the Socialist Party defector, who had left the previous administration to build his own movement and used it to win the presidency. His En Marche movement went on to win victory in parliament, promising the implementation of a whole host of reforms. These included the liberalisation of labour laws and the implementing of a separate eurozone budget. Macron’s pitch was clearly successful in getting him elected but it was also criticised by trade unions and there were concerns that his cobbled together movement could be somewhat shaky. Now, less than a year-and-half into his presidency, there are signs that it could be close to falling apart. It follows a series of political missteps that have seen Macron’s approval ratings plummet and a number of his top lieutenants departing. The latest departure saw France’s interior minister Gérard Collomb quitting the high-profile office this week. Macron initially attempted to block the resignation before reluctantly accepting it. Macron’s problems among the public have come from a failure to both deliver on economic reforms and to shed the charge from his opponents that he is a “president of the rich”. Opinion polls taken before this week’s setback put satisfaction in the 40-year-old’s leadership at just 29%, others have put it at as low as 19%. Many have pointed out how bad that compares with US President Donald Trump, who’s favorability rating in the US hovers around the 40% mark. But what has gone so wrong with a presidency with which so much was expected? Not least from europhiles who had hoped that he would provide a bulwark against the anti-globalist movements winning ground elsewhere. Firstly, France’s economy hasn’t improved much in the time he has been president. Patience is wearing thin for many as unemployment has barely budged since Macron’s election in May 2017, standing at 9.1%. Macron pledged to shake up an economy he claims is held back by excessive regulations and rigid labour laws. But growth has been slowing and is now widely expected to reach just 1.6% this year and 1.7% next year. On unemployment, his leadership style was again questioned last month when he told an unemployed gardener that he should look for a job in a restaurant or on a building site. “I send resumes and cover letters, they don’t lead to anything,” the 25-year-old told Macron, in a clip that quickly went viral. “If you’re willing and motivated, in hotels, cafes and restaurants, construction, there’s not a single place I go where they don’t say they’re looking for people,” Macron said. The Liberation daily went so far as to draw a comparison with the supposed suggestion by France’s last queen, Marie-Antoinette, that if the poor had no bread they should eat cake instead. Another comment in which he said that France spends “a crazy amount of dough” on social security programmes did little to soften his image. There have been other such examples as well. Like when Macron was criticised for lecturing a teenager on how best to address him. But the most damaging was the scandal surrounding a video showing one of his bodyguards roughing up protesters during a Paris demonstration. The affair blew up into a major scandal after it emerged that Macron’s office knew about the incident but kept the bodyguard on staff, only firing him after Le Monde newspaper broke the story. Internationally, Macron has also struggled on issues ranging from the fraying Iran nuclear deal to initiatives to end the conflicts in Syria and Libya. His drive for EU reform is also floundering as Brexit dominates the talk in Brussels. Macron’s main international achievement has arguably been an apparently close relationship with US President Donald Trump. Trump was so taken with a visit to Paris that he planned his own French-style military march, while a return trip of the Macrons to Washington was also seen as a success. It even included an astonishing shot of the US president dragging his fellow head of state by the hand. That picture made the front page of The Washington Post midway through the visit. 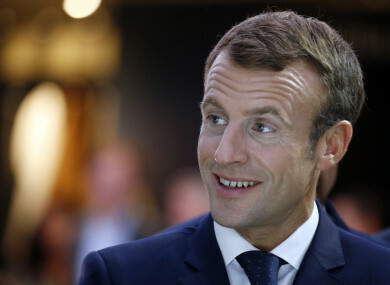 On another foreign trip, this time to Denmark, Macron managed to create controversy by seemingly insulting his own people by claiming they were resistant to his economic policies. The comments came during an exchange with French expats in which he praised Denmark’s strong social security system, something which allows companies to easily fire workers. Macron said that it was a product of culture and unlike “the Gauls who are resistant to change”. The remark echoed previous comments by Macron saying the French “hate reforms” and that the country is “unreformable”. All these incidents added to the feeling that the sheen had come off Macron’s leadership perhaps sooner than other French leaders. Now though, it appears to be approaching a crisis with the loss of his latest ally. Collomb’s departure comes just weeks after popular environment minister Nicolas Hulot resigned live on radio without warning Macron. That incident alone was seen as a major setback but added to everything else it has now led to serious questions about his presidency. Email “It's all gone wrong for Emmanuel Macron ”. Feedback on “It's all gone wrong for Emmanuel Macron ”.